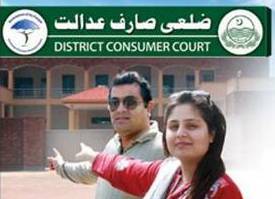 Home / Consumer Courts / Consumers / Prices in Pakistan / Punjab / Punjab Government / How to file a complaint in District Consumer Courts? How to file a complaint in District Consumer Courts? 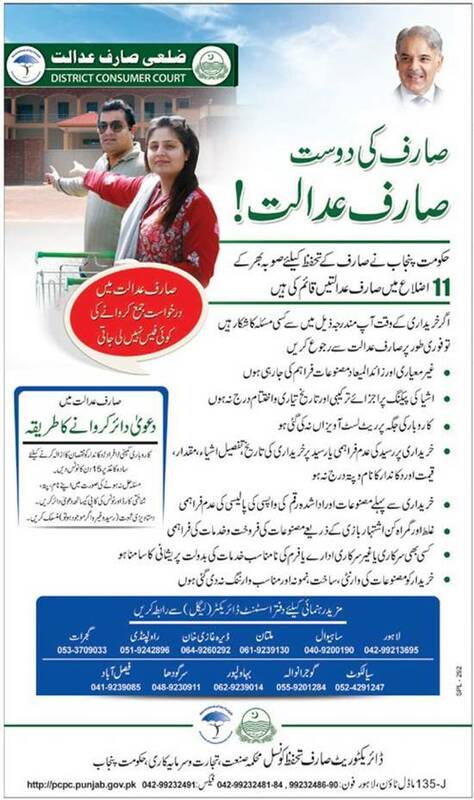 District Consumer Courts have been established and successfully working in 11 districts of Punjab since 2007. Although these courts are established only in 11 districts, people belonging to other districts can also file their claims in corresponding nearby consumer court. These courts are meant to provide protection to consumers rights. If any consumer faces any discrepancy from any manufacturer, service provider, supplier, shopkeeper, government department and etc, he can file a case in the district consumer court. Justice is available free of cost and within possible short time period to public for resolving their complaints. Consumers can file complaints in District Consumer Courts as well as before DCO (District Coordination Officer). How to File a Complaint in District Consumer Court? Procedure to file a case is very simple. There is no court fee and you don't even need to hire a lawyer to file a case in a consumer court. Serve a 15 days legal notice on plain paper to the service provider/ company or shopkeeper through registered post. If your complaint is not resolved within 15 days, you may file a claim yourself or through a lawyer on plain paper within subsequent 15 days before Consumer Court. You have to attach the copy of legal notice, copy of CNIC, Receipt (if you have any) and any other proof etc. There is no court fee and no condition of hiring a lawyer. Court may punish the violator with imprisonment up to two years or with fine up to Rs.100,000 or with both in addition to damages or compensation. How to File a Complaint before DCO? Consumers may also file a complaint before DCO (District Coordination Officer) on plain paper for violation of; duty of disclosure regarding service or product, display of prices, issuance of receipt. DCO may fine the violator up to Rs. 50,000. I purchased power bank through online,paid by money by easipaisa to online company named lootolo,but they did not send me tye product nor return my money back.three month passed,company did not respond my emails and calls. I need to register complain by email as i am in muzaffarabad azad akshmir.please guide me how to lodge my complain against the company? Your first mistake making advance payment, it is advisable to purchase against cash on delivery. Now simply send them a notice by registered mail or TCS courier placing on record your order Number, easypaisa payment evidence and request them to deliver or refund within 15 days otherwise you will proceed with legal recourse. If your complaint is settled within 15 days, good otherwise attach the copy of notice with other evidence's attached to your local Consumer court. Contact me so that i can guide you in this regard. I ordered the tailor to prepare coat for me. Paid 2000 in advance. He promised to prepare in time but didn't prepared on time. i waited for three hour for delivery but they made lame excuse. came a week after to collect the coat but it was discovered that they issued me wrong receipt(which is with me as proof) for my coat but it was another customer order wrongly recorded at my name. Again no delivery made. i waited and suffered. Plz. guide me about this. Should i go for consumer court.